Sporty and cute, our pink and white polar fleece letterman jacket nails the retro high school kid look for your child's sock hop or cheerleader costume! 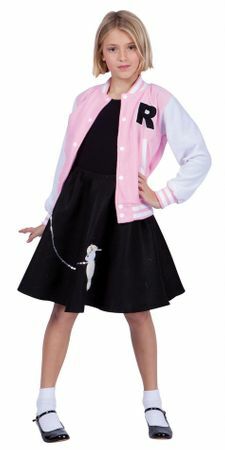 Realistic sporty details like white snap buttons, pink and white striped trim, slanted front pockets, and a black capital letter "R" on the chest make this varsity jacket stand out from the crowd at the sock hop or track meet! Poodle skirt, socks and shoes not included. 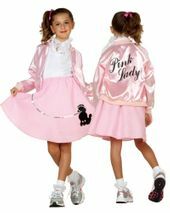 To create a look like the one in the photo, check out our Children's 50's Costumes department for everything you need!